Celebrating the life of Donald Earl Shimmell, Jr.
Obituary for Donald Earl Shimmell, Jr.
Donald E. Shimmell, Jr., age 59, died Monday, January 28, 2019 at Mercy Health St. Mary's in Grand Rapids. 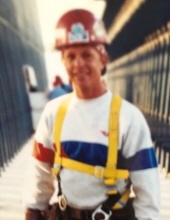 He was born November 1, 1959 in Grand Rapids, the son of Donald and Josephine (Wiley) Shimmell, Sr. Don was a smart and outgoing man with a great sense of humor and strong work ethic. He is survived by his daughters, Amber (Doug) Rau, Ashley Wiers, Haley (Kyle) Rohr, and Jodi DeVoogd; his ex-wife, Cheryl Munson; 12 grandchildren; siblings, Susan Shimmell, Joan Stevens, and Nancy (Joe) Wardell; girlfriend, Sheryl DeVoogd; and many nieces, nephews, other relatives, and friends. A memorial gathering in celebration of his life will be held from 11:00 am to 2:30 pm Sunday, May 5, 2019 at Townsend Park. Sympathy cards and memorial contributions to assist the family with final expenses may be mailed to Amber Rau, 5026 Gahan Ave. NE, Rockford, MI 49341. To send flowers or a remembrance gift to the family of Donald Earl Shimmell, Jr., please visit our Tribute Store. Guaranteed delivery before Donald's celebration of life begins. "Email Address" would like to share the life celebration of Donald Earl Shimmell, Jr.. Click on the "link" to go to share a favorite memory or leave a condolence message for the family.